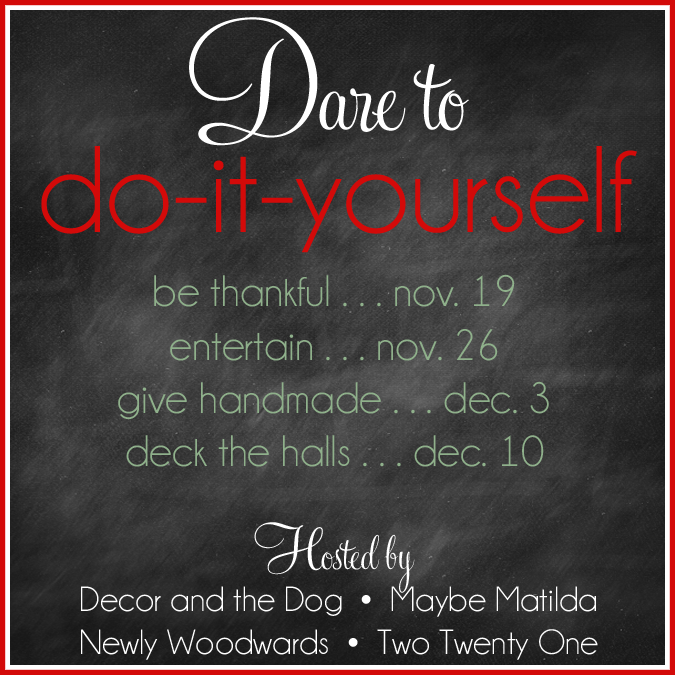 I'm back for the final week of the "Dare to Do-It-Yourself" challenge hosted by Decor and the Dog, Maybe Matilda, Newly Woodwards, and Two Twenty One! I am so sad that this is the last week and I feel like a super slacker for posting this so late... going back to work is cramping my blogging! I hope to find a good balance soon because I have really enjoyed posting more frequently. Anyway... it is time to deck the halls!!! I decided that I would decorate our basement. This is a space that has come together in the last two months. Previously it was just used for storage and was really wasted space. I will share the entire space in January but for now you can have a peak with the decorations near the fireplace. This space will be used as a kids livingroom/playroom and will eventually have a tv over the fireplace for video games but for Christmas this year I have decided to wrap up random pictures/artwork and added fun ornaments! I also put up a tree down in the basement for our homemade and brightly colored ornaments. Upstairs we have very traditional decorations so I am so excited to have a new space that can be fun, colorful and sparkly! Emma also had a blast helping me decorate "her space" as Hunter is currently too small for a playroom. These "gifts" above the fireplace are just random photos that we had wrapped in our kids Christmas wrapping paper from Costco. Smaller ornaments are collected in glass vases from our wedding. How sad is it that all of those gifts are for Emma and Hunter! At least I'm done shopping. All of their gifts are wrapped in the fun colorful paper while adult gifts are in gold and silver and under our main Christmas tree. Emma was so proud to put all of her ornaments on the tree. Did you pick a winner for the giveaway! Everything looks so pretty! I love that you made it so bright and fun! And I love the wrapped "gifts" on the mantel. I LOVE the gifts on the mantel! Such a festive room. 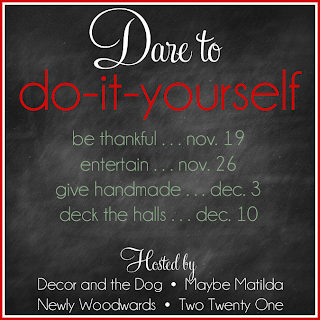 Thanks for joining the Dare to DIY!! All you need is some J-O-Y!! Personalized Cheese Dome and a GIVEAWAY!